Hello and welcome to the first Sentimental Sundays Challenge! Second, um, I guess I'm in need of a design team, lol. - Create a project (card, scrapbook, digital layout, alter item, anything) using any sentiment from any company every other Sunday using the challenge theme. Join the Sentimental Sundays Yahoo group for DT communication and to chit-chat and share your creations. - You will have access to all the digital sentiments I create for sale (such as the ones for Whimsy Stamps here) or others that I may sell elsewhere in the future. Of course, you also have access to all my free digital sentiment sets. If we have sponsors, you will have access to sponsor products if/when they are offered to the team. - Your name and blog link will be permanently displayed on the sidebar. - Design team call ends Sunday, May 9. To apply, please email me (Ann) at raindropecho@gmail.com with your name, email address, blog address, and why you would like the join the Sentimental Sundays team. This will be a very carefree team and designed-to-be-fun group so I'm looking for some laid back individuals who just love to craft. If that's you, I would love to hear from you! Here's the freebie for this week. I thought I would go with sentiments that everyone could use at one point or another. I call it "The Basics" sentiment set. Each sentiment comes in different formats for some versatility. Enjoy! The prize for this challenge will be a digital sentiment set of six sentiments of your choosing! 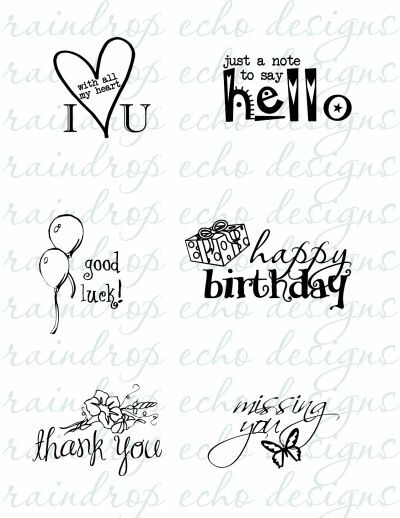 That's right, you tell me what to put on the page :) If you would rather just have a pre-made sentiment set from the Raindrop Echo Designs Whimsy Stamps Digital Collection, you're welcome to have one of those instead. Thank you for joining me for this first challenge! I will try to comment on ALL your entries, but if I hope you understand if it takes a little while to do so. I do appreciate you entering your creation; I find inspiration from everyone! Well, I've finally taken the plunge and started my own challenge blog. For those who know me, you know that I have this teeny tiny thing about challenges - I absolutely love them! This challenge blog focuses on sentiments: short, long, funny, serious, quirky, religious, seasonal, original, classic - pretty much any type of sentiment you can think of! This blog is for fun! Although there's a possibility that we will have sponsors in the future, including me giving away some digital sentiments from the Whimsy Stamps Digital Collection (releasing April 12), this blog is just mainly to challenge you to use words to enhance your cards, scrapbook pages, altered items, and other things that you create. For weeks that a prize is offered, your creation must be entered into the InLinkz widget before the start of the next challenge (usually around 12:01 AM EST on Sundays unless I'm running late). That which makes thousands, perhaps millions, think."